including designer paper for the paper piecing technique used for his uniform, which is a fun way of colouring in your images. 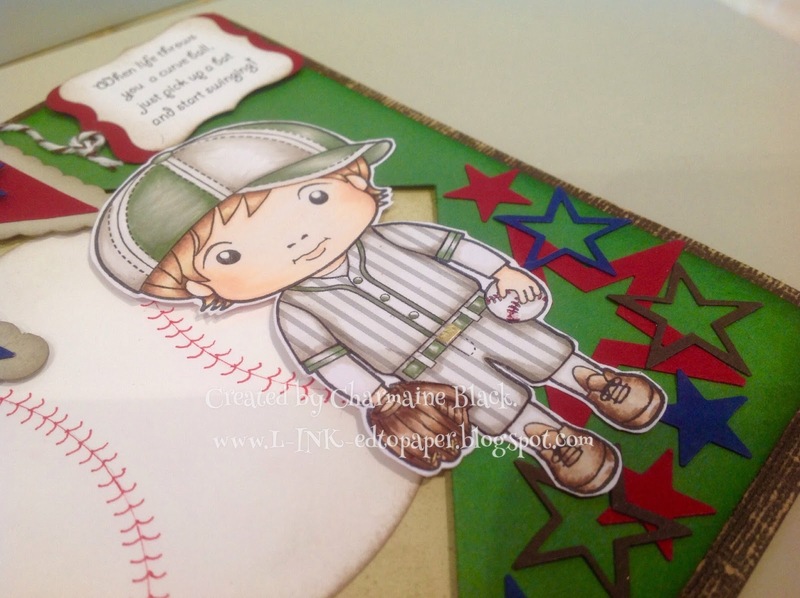 I rarely colour in boy images so this was quite a struggle for me to be honest, I guess it's because I only had girls and wasn't really in the habit of making many cards for boys. I hope you like him and if you have any questions please don't hesitate to contact me, don't forget I love to get some blog lovin' too so please leave a comment to let me know you've stopped by for a visit. Hi there craft lovers, I've had a very special weekend of birthday love, my eldest daughter flew over from Melbourne and was able to join our family for a birthday dinner at our favourite restaurant, the only one missing was daughter number two as she is currently living back in the UK ;-(. Anyhooo! this post is about the wonderful medium of water colour, I love dabbling in a bit of water colour technique and this was no exception. Gold Coast, I was privileged to watch a lovely young lady called Petra Tailor do a really lovely technique in one of the booths. this first card is my interpretation of her technique, using a few different colours but I love this technique and will definitely be using it again. Can you spot the beautiful new set called 'You've got this' I'm totally in love with this set, the sentiments alone are good reason to have this set in your stash. check it out on page 113 of the new catalogue, if you don't have one you can either browse it on line on my website found to the right after the 2nd of June, or you can contact me for your very own hard copy. the colours aren't that great in this photo but I'll do my best to get another one done soon to show you, I've used the new colours Delightful Dijon, Mint Macaron and the returning colour Night of navy. The ribbon is Wisteria wonder seam binding and the card is matted onto silver foil, onto brushed silver then onto Whisper white. The second card is a new technique I've developed using an aqua brush to do the thumping technique instead of the usual marker pen way. I have used the new colours that were mentioned above as well as Old Olive and Rich Razzelberry. Just click on pictures for better view of colours. Hi there friendly blog suffers, I have returned from a great convention on the Gold Coast held by Stampin'Up!. As per usual we were all spoilt with lots of presents and door prizes etc. those of us that were titled manager or above also got an extra day for leadership training as well as a fabulous night of entertainment at the Out Back Spectacular show. It was an amazing show and I would thoroughly recommend it to anyone visiting that area in the future. Well we had some great surprises at convention including the hot off the press about to be released catalogue for 2015/16, you're gonna love it! and I cant wait to share lots of the new goodies with you all, however in the mean time I will share some cards that I've made over the past few weeks and not posted. so to start with here's my birthday card which I made for little Lucy , our precious God daughter who turned one a couple of weeks ago. 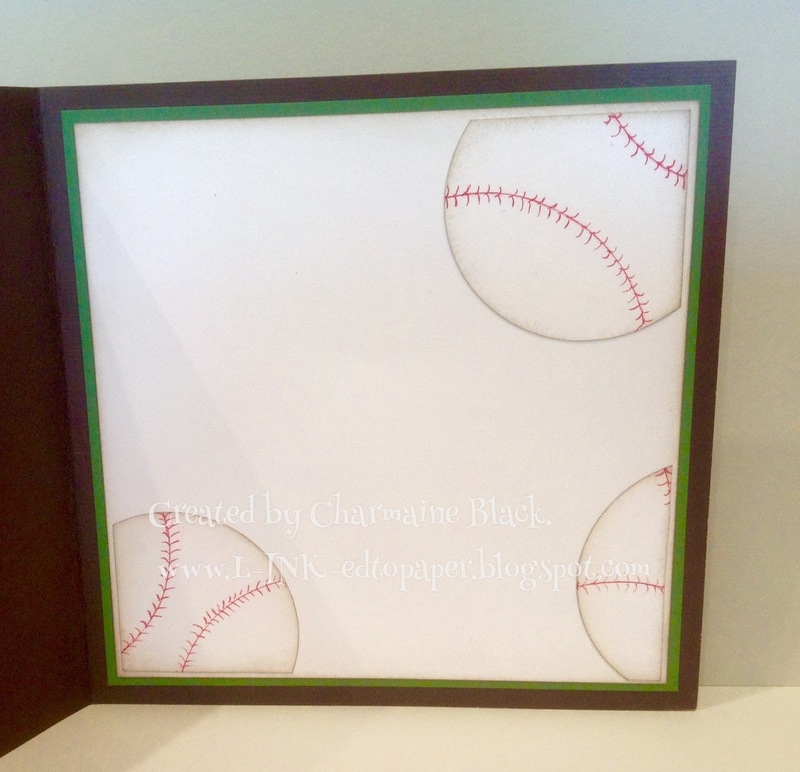 I made this card using Stampin'Up! punches, it was really fun and I was super pleased with the outcome, I found the original on Pinterest but changed colours and a few of the punches. 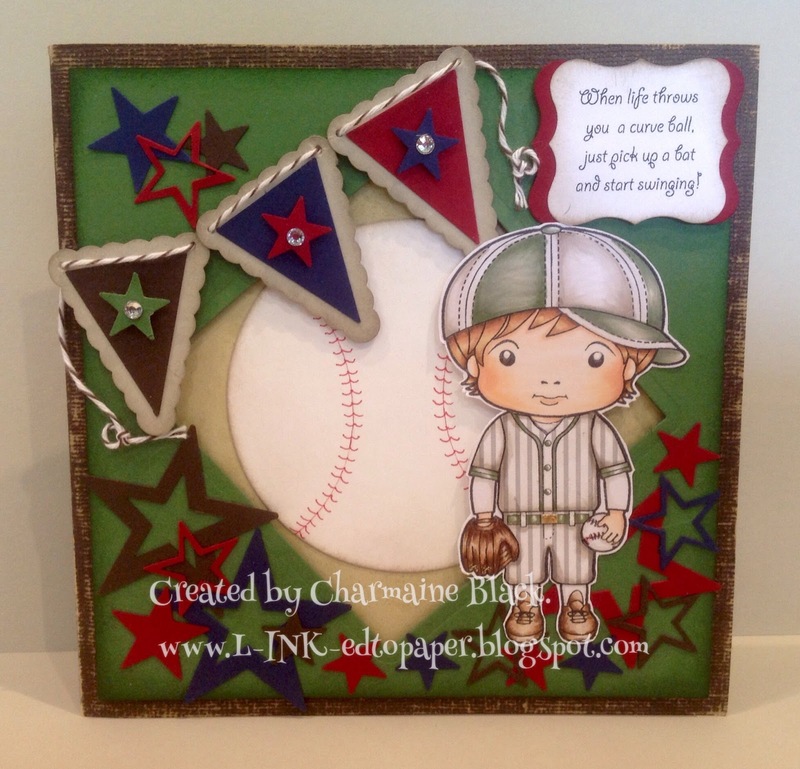 Hope you like it, have you made any punch art cards lately? The new Stampin' Up Catalogue is being released soon, demonstrators have been ordering all day selecting stamp sets, the New In Colour Inks & Papers and fun accessories early. NEW demonstrators can also get them in their starter kits! Email me at charmaineblack@y7mail.com or call me 040 232 0779 to ask any questions you may have. 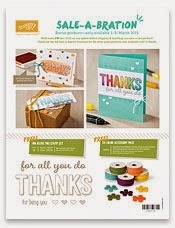 The starter kit is for hobby/discount shoppers as well as those wanting to teach classes or to start a business. FREE shipping for the starter kit to sign up. You will also receive a fabulous business supply kit valued at $80.00 added to your kit for FREE, making a total value of $315.00 for just $169.00. TOTAL: $235.00 you pay just: $169.00! And your first full order out of the New Catalogue of $300 or more within 45 days could be at a 30% discount. You can sign up HERE if it's right for you! Hi there paper crafting friends, I've been a little late in posting a few photos for you, so I will endeavour to make up for it in the next few days with lots of completed projects. 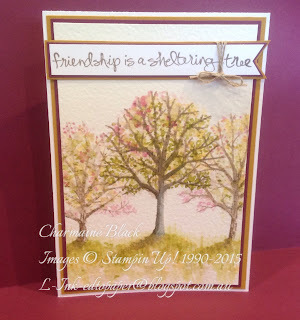 These first ones are of an Easter Stamping day I had with some inky friends, we made some Easter cards and three D projects as well as an interactive card. 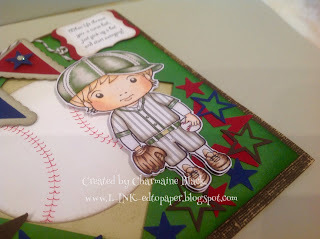 Here's the Easter Bunny step card, that we all made using lots of Stampin' Up! punches and designer papers. I found the original on Pinterest by Jackie Topa, a very talented stamper in the US. the next projects were these cute little "bag-in-box" containers which fit a small chocolate Easter egg inside for a treat. 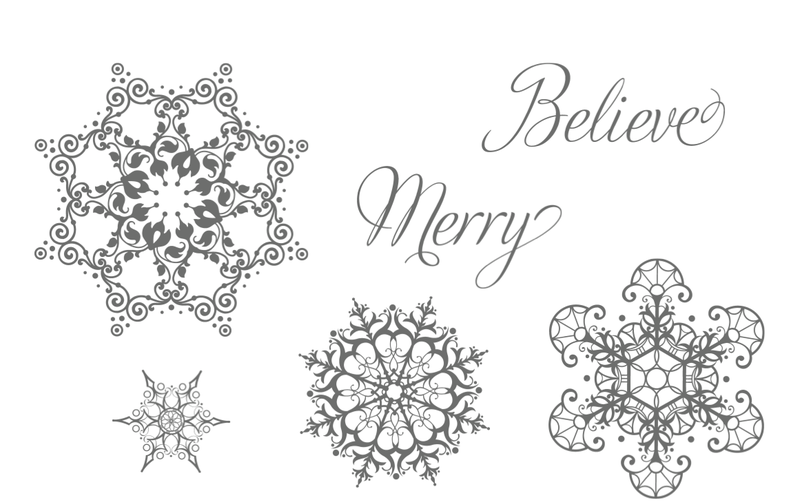 These were found on 'Pootles' site along with a great little tutorial on how to make them using the fabulous Stampin'Up! envelope punch board. We have to have chocolate to keep our energy levels up when stamping! there are several versions of this card out there on the net so I'm not entirely sure of where I found the original. It was lots of fun to make and it's always fun to see the recipient open it. I hope you all had a beautiful Easter celebration with your family and loved ones. Hi there inky friends, I hope this finds you all well and with ink on your fingers. 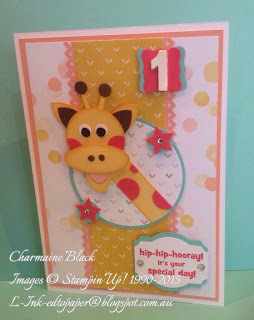 I have been longing to have a go at a block 'step' card and I also needed a baby card for a friend who's expecting her bundle of joy any day soon. 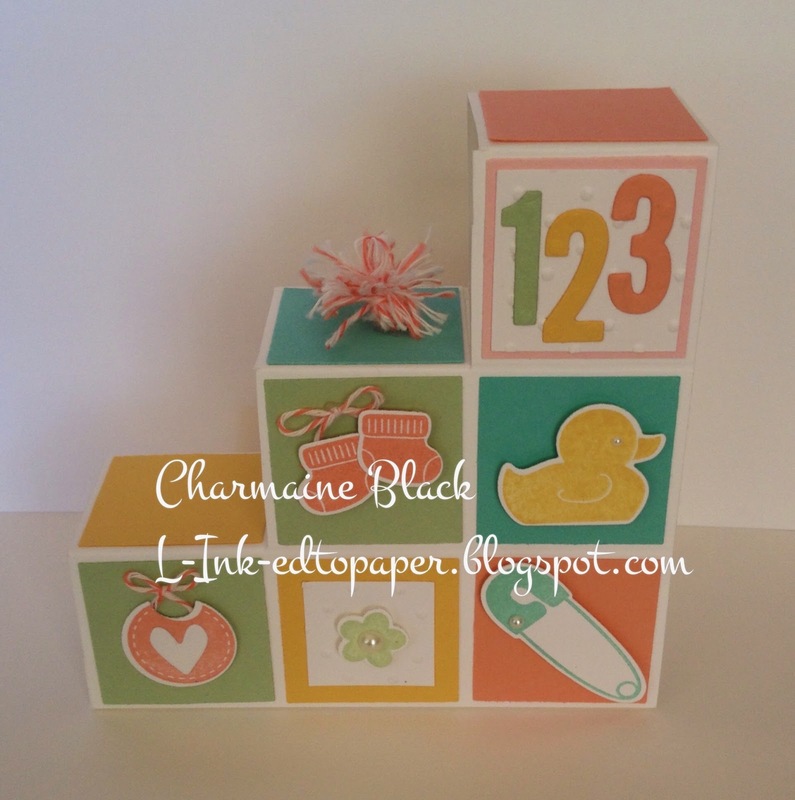 So I had a little look online to see if I could find any help to make one of the block type step cards I was after, it didn't take long thanks to the wonderful World Wide Web! This is the card I decided to case with the help of a couple of different video tutorials , one being by D. valder who's card I decided to case. 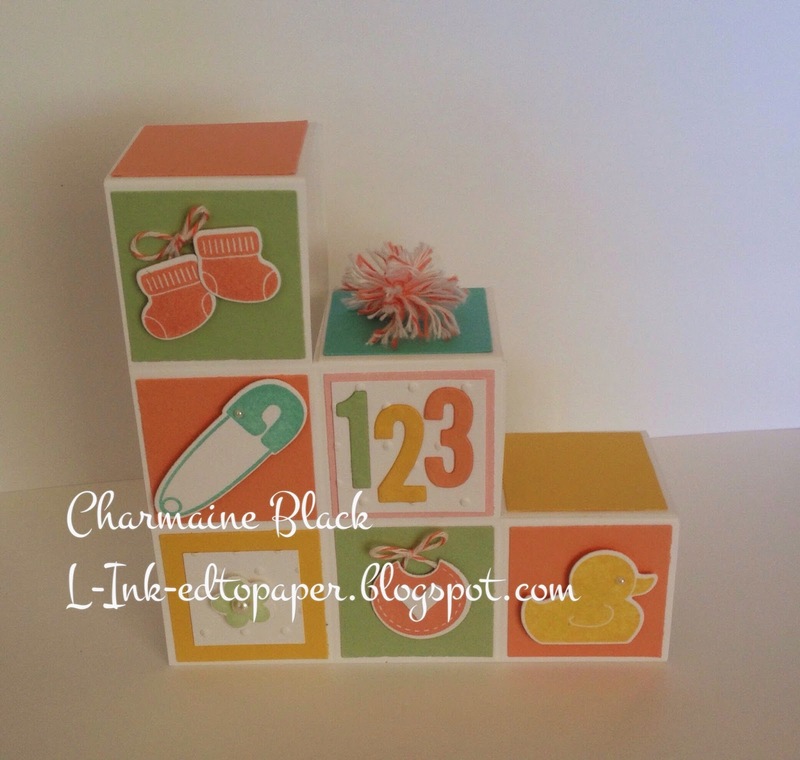 I had lots of fun making this card and used the great set called ' something for baby' which has wonderful dies to match, so no fussy cutting....Phew! It was certainly a lot easier than I thought it would be and I will definitely be making some more of these cards with different themes. Have you made one of these and if so what theme did you make yours in?? 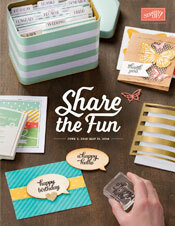 Hi there craft lovin' friends, I have a really nice and unprecedented surprise for you from Stampin'Up! Never before have we seen extra gifts bestowed upon us for the Sale-A-Bration period from SU but this year is special, because the Sale-A-Bration period is longer than usual they will be releasing some extra FREE goodies in the month of March for all qualifying orders, how cool is that! Please don't be too slow in picking out your favourite items and be sure to get your orders in with me before you miss out on these amazing new sets, papers and accessories. Enjoy these lovely carry over items until the 27th of Aug.2014 while stocks last. I have been married for 27 years I have two beautiful daughters, and several rescued birds. We arrived here in 1996 from the UK, we were looking for a better life and we found it! In the hills, surrounded by trees, birds, kangaroos and a myriad of other wildlife, which I must say makes for an interesting life! I lived on a yacht for most of my young life with my parents, we traveled the world and I was educated in several different countries and languages... Hence my spelling leaves one a little confused at times. I studied AUSLAN (Australian Sign Language) for 3 and a half years with my youngest daughter, I hope you enjoy reading my blog and that it will be a source of amusment as well as enlightening at times. 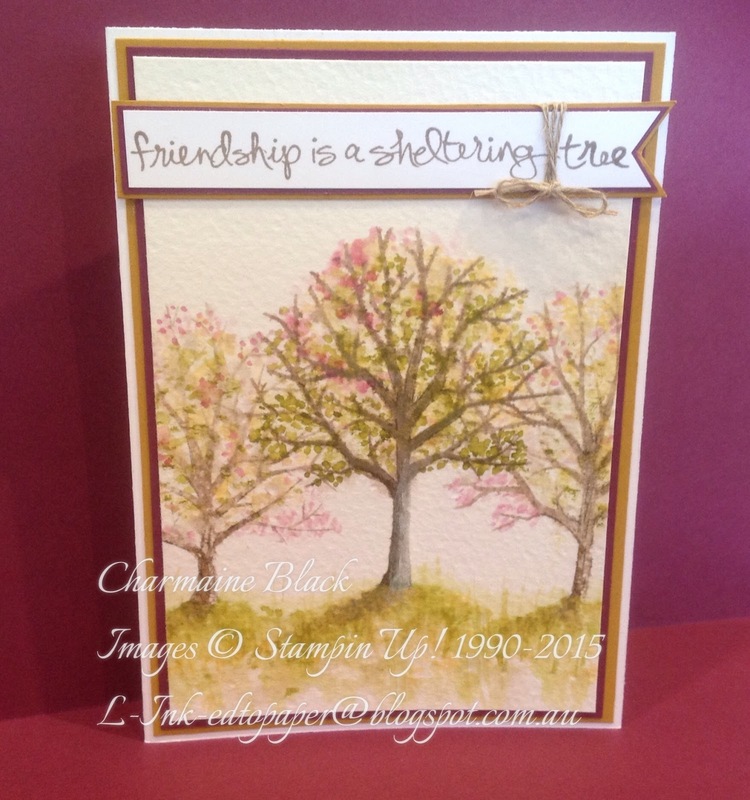 Images on this site are © Stampin' Up! ® 1990-2015 unless otherwise stated. 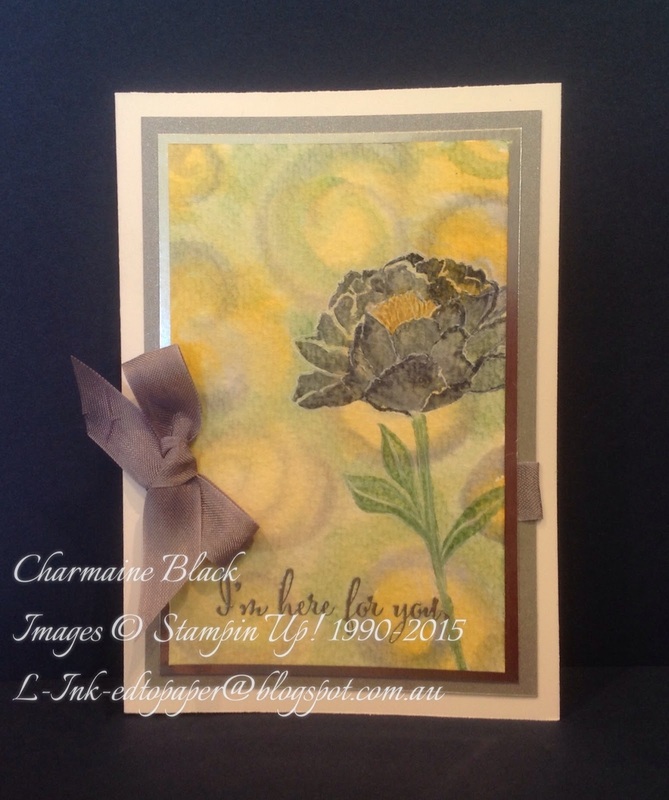 Content including photographs and designs are © Charmaine Black unless otherwise attributed. My designs and artwork are for your personal inspiration only. They are not to be copied for publication or other monetary gain. Thank you!